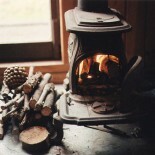 Most free-standing stoves are adapted to burning wood and briquette, some furnaces can also burn bituminous coal. Large vapor content creates smoke and causes setting of the soot on the glass and in the chimney. Ash created in the burning process constitutes only 0,5% of burnt fuel and can be used as a fertilizer. 1 cubic meter of wood costs about 20-35£ (depending on its type and humidity). Wood briquette – it is made from compressed sawdust, an ecological product without any addition of flammable substances. It has greater burning efficiency than wood (briquette – about 16,5 MJ/kg, wood – about 15 MJ/kg). Ash constitutes 0,6% of briquette’s mass and can be also used as a fertilizer. Briquette burning process does not emit a lot of dust and gases. One metric ton of briquette costs about 60£. This entry was posted on August 2, 2014 by jbellamy1 in Fireplace, Tips and Advices.